The global automotive industry is constantly expanding and there is no dearth of opportunities in this highly rewarding segment. 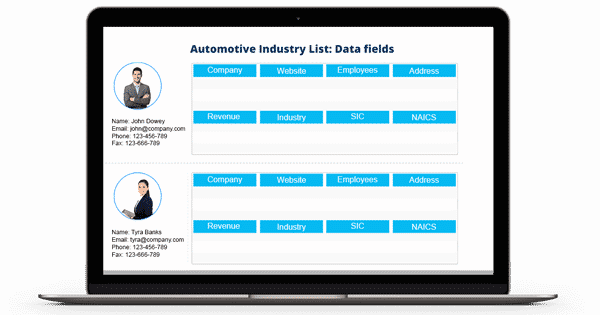 If you are a marketer who is hunting for high-quality marketing data for your promotional campaigns in the automotive segment, Blue Mail Media can provide you with highly accurate and reliable Automotive Industry Email List. Our comprehensive database consists of all relevant information to help you reach out to your potential customers via telephone, email or mail. Our Automotive Mailing Lists is assured to aid you in achieving a higher response rate, greater conversions and ROI. Blue Mail Media’s Automotive Industry Email Database is designed to help marketers flawlessly execute their marketing campaigns and expand their reach to top decision makers, C-level executives and professionals involved in the automotive industry. Blue Mail Media has been able to carve out a niche in helping marketers with reliable B2B marketing data. Our list of Automotive Industry Mailing List will help you tap greater business opportunities in the sector and discover new avenues of revenue. Blue Mail Media has a network of data partners across USA, UK, Canada, Europe, North America, APAC and other regions, which enables us to serve clients without barriers. Our data team puts great efforts in obtaining high-quality data from reliable sources, verifying data for accuracy and updating the same on a timely basis. Also, you can choose from our pre-packaged list of Automotive Industry Executives Email List or you can opt for a customized list that aligns with your campaign specific requirements.